Find hotel near Sate Babi Bawah Pohon (ca ..
Come to have a fresh taste of Bali in Sate Babi Bawah where they serve an assortment of dishes, all authentic to the kitchens of the city. It is one of the most frequented food places in the city and quite popular among folks and tourists alike. Come with your family after a long day of tripping and refreshen your mood and appetite with a platter-full of amazing Balinese Cuisine. Ensure to taste its Pork specific dishes as it is the speciality of the place. Abounding of places like Tanah Lot Temple, Tirta Empul, Mount Agung, Mount Batur and Bali Bird Park, city name has great things to do that are totally worth your time. Explore Sate Babi Bawah Pohon (cabang) and other prime spots of the city using Bali trip planner. You can enjoy a comfortable stay in the city by booking the best hotels in Bali like Yulia Village Inn Ubud, Bije Sari Suite Bisma, Batu Empug Ubud and Gatra Ubud Inn. Find out how to reach Bali to begin with. Plenty of wholesome Bali vacation packages are available to choose from, pick your today! Nothing special, pictures on here look much better than they did in real life, taste was not the best I've had, but not bad. 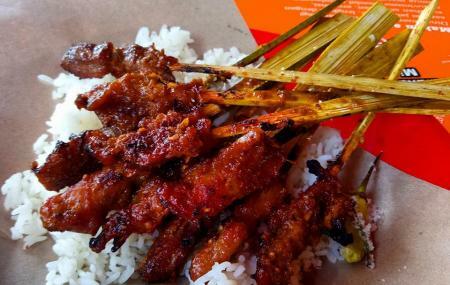 Price was 78k for bintang, coconut satays and goreng nasi. Was expecting much better based on the reviews.